Read 2 times. Last read October 22, 2012. Andrea Nash is rebuilding her life after being removed from the Knight of the Order. Her relationship with Raphael Medrano has taken a turn into unknown and not so great territory. Aunt B is pushing her to join the Clan Bouda. To top it off, Andrea is called in by Jim to investigate 4 murders that have taken place on Raphael’s job site. To say her life is a little complicated right now is an understatement. Let me start by saying, I’m a huge fan of the Kate Daniels’ stories but was unsure how’d I like a full novel about Andrea. What was I thinking??? Ilona Andrew proves once again that no matter what she writes she will blow you away with an action packed adventure filled with brilliant characters, a great story and a riveting mystery… LOVED Andrea’s tale and her transformation into her real self. Without a doubt, another BIG 5 stars for a wonderful read by Ilona Andrews. 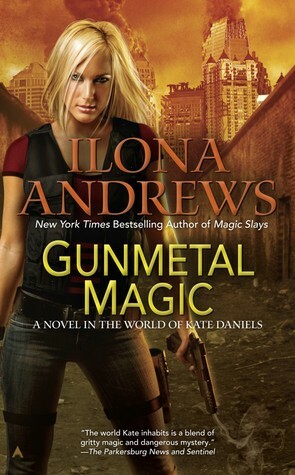 Sign into Goodreads to see if any of your friends have read Gunmetal Magic.